Giant Clams are known as a ‘keystone species’, that is, they are of great ecological importance in reef conservation efforts. They are multi-talented organisms, they produce a shell through the use of symbiotic zooanthallae algae, which adds to the reef structure, and they also filter the water to the tune of hundreds of litres every day, from harmful microalgaes which suffocate living corals. They are the champions of biodiversity, and therefore we need to help them thrive in increasingly challenging environments. 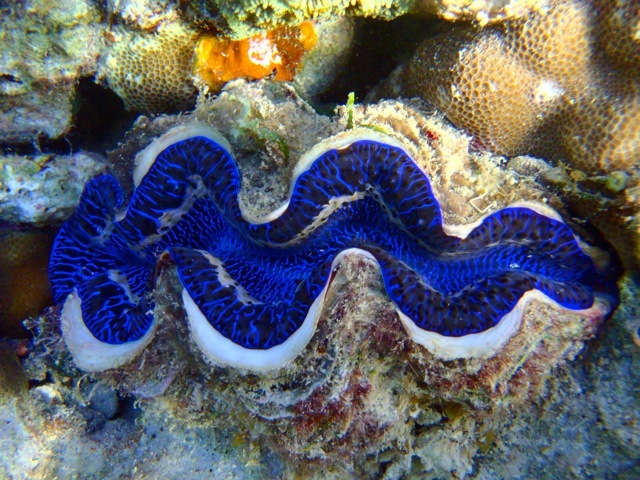 The Giant Clam, is a delicacy in many cultures, and much like the shark fin problem, they are more economically and ecologically valuable alive than dead. A number of organisations across the region recognise this and are putting methods in motion to protect the organisms and increase numbers in the waters. 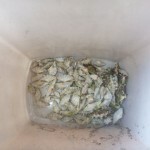 Clam restoration projects are long term investments, as it can take up to three years for the organism to reach sexual maturity and optimum efficiency, and so we need to see a high level of investment (time and money) and real commitment to the protection of the species to reap the effects. The reproduction process, is highly complex. As Giant Clams begin life as males, and then develop into females 2-3 years later. Reproduction methods currently being tested include inducing this process through subjecting the clams to ‘heat stress’, which allows the release of sperm and eggs earlier than normal. Once fertilization has occurred it takes 12 hours for larvae to hatch. They are nurtured in observatories until they reach juvenile maturity at 6-8 months, when they are transferred to an open water cage until they mature enough to be introduced to a reef. Sea Cucumbers are of equal importance, as they facilitate the reduction of acidification in the ocean. They ingest sand, which increases PH levels in the water where they defecate which counters the negative effects of ocean acidification as well as acting as a fertilizer. The main product of the cucumber’s digestive system is calcium carbonate, and for coral reefs to survive they must accumulate more calcium carbonate than the erosion rate which is rising. 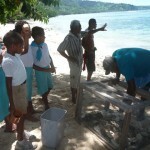 They are reef cleaners, and eat dead organisms which allows the reef to breath. It is therefore imperative that communities are aware of the numerous benefits of both species, and see that they are better off alive and thriving than being harvested for other purposes. Sea Cucumbers have been a trade item in Fiji for over 200 years, and with the advancement of scuba tech has meant more organisms have been stripped from the reef bed than ever before. There are survey projects underway in the region to monitor this, and spread the word throughout the local community and the tourist community of the importance of these organisms. 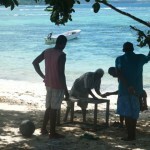 Island Spirit is looking into repopulating some reefs with giant clams which are bred on Viti Levu, the main island. This project is a work in progress and we look forward to keeping you updated. If you would like to get involved in one of our upcoming volunteering projects email kirsty@island-spirit.org, or alternatively click here.